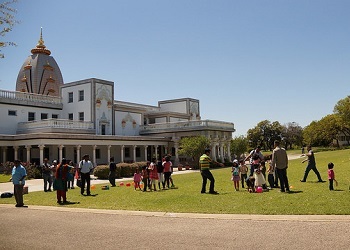 Learn more about who we are and our unique campus located on the Radha Madhav Dham grounds. View and register for our updated 2018 class offerings and their respective syllabus, price, dates, and times. Meet the Shiksha teachers and staff. All are qualified and will provide excellent classroom experiences. At Shiksha, children choose from a variety of extracurricular topics and learn the subjects of their interest from qualified teachers. 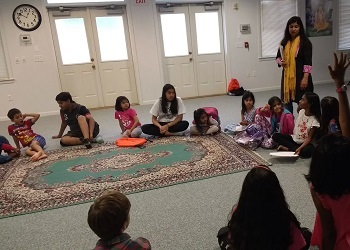 In addition to enriching children’s spiritual and cultural development through traditional classes in Hinduism, Dance, Language and Music, Shiksha teaches them unique skills they can use to excel among their peers in school by offering classes in Vedic Math, Test Preparation Classes and Robotics. Children learn in the most serene and devotional environment of Radha Madhav Dham where traditional Gurukul‐style outdoor classes are mixed with modern indoor classes to provide a fun‐filled learning experience. 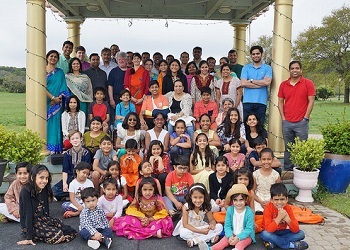 Held every Sunday, Shiksha’s calendar follows that of Austin’s K‐12 school system – providing a consistent, year‐long extracurricular enrichment for children. I invite you to review descriptions of classes and guidelines presented in this handbook and use this invaluable opportunity to invest in the extracurricular education of your children by enrolling them at Shiksha. I also encourage you to be part of Shiksha – a non‐profit educational organization – by being its teacher, volunteer or donor. Thank you for your interest in Shiksha.